I was in both Selfridges and Harrods a couple of weeks ago, wandering around the Wonder Room and Luxury Accessories Hall, respectively, doing some mental Christmas shopping before I have to bite the crowded bullet later this month. Whilst both of the department stores Hermes concessions have varied products, they both complement each other by that they don’t seem to replicate product. I first saw the black oiled leather Hiking boots in Harrods, sitting quietly unnoticed on a mid-height shelf but after picking them up, I knew they had to go on my Christmas list. Why? They are masculine but have the silhouette of a boot that should be worn with decided consideration and style. Similarly, it was the Him calfskin chelsea boots in Selfridges that were hidden around a back corner (that bit by the ties) that stood out the most in terms of quality of materials, construction and aesthetic. 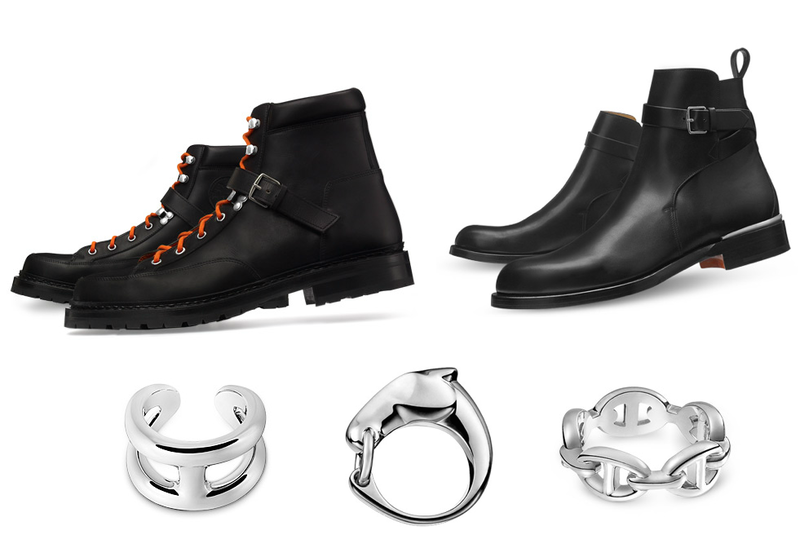 Today, I found myself going through the Hermes website for a Christmas present for myself. It’s a tradition really; whilst the shoes can come from Father Christmas these other pieces are items that I can buy myself. Starting with these sterling silver rings, they are the most masculine and true to the Hermes brand, however I do think the Galope Hermes piece in the centre is conceptual as it is stunning. The classic Chaine d’Ancre Enchainee, right, represents the heritage of the brand in terms of it’s visual identity however the simplistic identity comes from Osmose, left. Hermes is, of course, known for it’s leather goods so I could not escape these essential pieces. I saw this delectable Citizen Twill card holder, left, in Swift calfskin with the discreet but utterly chic silk printed lining that has one central change slot and two cards places, it’s just the ideal for a night out without taking my whole wallet. However, taking both a card holder and wallet out, the Bastia change purse is indispensable. But for the ultimate in travelling, there is no denying the Tarmac passport holder is a must. your collection is very unique and cool. Here are my favorite accessories collection from where i purchase when i want. I really like your all the post. Thanks for this fantastic share.